Today, Blakeney is a small and quiet village, now thronged with tourists rather than the bustle of ships and trade that brought prosperity to this part of the North Norfolk Coast. The villages of Blakeney, Cley and Wiveton make up the Glaven ports, around the mouth of the River Glaven. The gradual growth of the shingle spit known as Blakeney Point protected the wide estuary at the mouth of the river, which was an ideal site for a harbour. This estuary has gradually silted up to form the salt marshes that now attract bird watchers and walkers, rather than ships. Although no distinct settlement sites have been found, there is some evidence of early occupation in the parish; prehistoric flint implements have been found scattered throughout the parish, including Mesolithic flint flakes (NHER 6127), Neolithic axeheads (NHER 6129) and a scraper (NHER 22335), as well as Beaker pottery (NHER 6128) and a Bronze Age awl and spear (NHER 33247). Two Bronze Age barrows (NHER 6131, 6132) on Blakeney Downs are still visible as earthworks, and another barrow (NHER 6153) contained an Early Saxon inhumation, showing that prehistoric monuments continued to have a resonance in later periods. Blakeney was not as an important a port during the Roman period as it was to become in the medieval and post medieval periods. There was probably a small settlement in the parish, and Roman coins and brooches (NHER 29163, 33247, 33819) have been found whilst metal detecting, as well as fragments of Roman pottery (NHER 33615). St Nicholas' Church, Blakeney, showing the two towers, the seven lancet east window and the clerestory. Blakeney comes from Old English meaning ‘an island or dry ground in marsh’, but the name does not appear until the 13th century. In the Domesday Book the only settlement mentioned in the parish in Snitterley, meaning ‘a clearing belonging to Snytra’. The relative history of Blakeney and Snitterley is obscure, and it is unclear whether they were once two separate settlements, or whether Snitterley gradually became known as Blakeney as the port became more wealthy and important. In the Domesday Book Snitterley is not a very large settlement, but it is listed as having a church. 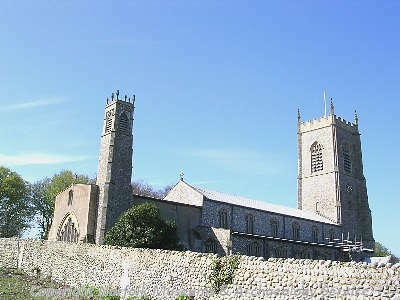 St Nicolas’ Church (NHER 6167) dates mainly to the 14th and 15th centuries, but Late Saxon pottery has been found in the churchyard. Several Early Saxon brooches (NHER 24419, 33819) and a bracelet (NHER 33820) have been found in the parish, and Late Saxon coins (NHER 33819) and metalwork (NHER 33247) has also been found, suggesting that a small Saxon settlement continued to develop in the parish. It was during the medieval period that Blakeney became a prosperous and busy port, and documentary evidence has shown that by the middle of the 13th century the port was already well established. During the medieval period the trade of salt fish was crucially important, and the Glaven ports were well known for providing supplies of cod and ling as far afield as London. The only reminder of this medieval prosperity is Blakeney Guildhall (NHER 6133), the house of a wealthy merchant in the 14th or 15th centuries, with a brick vaulted undercroft. Inside the medieval parish church of St Nicolas are 16th century graffiti depicting sailing ships. A Carmelite Friary (NHER 6158) was founded on the edge of the village in the late 13th or early 14th century, but only a few fragments of masonry have survived. The prosperity bought by fishing, and by trade with countries as distant as Iceland, continued into the post medieval period, and manifested itself in the wealth of post medieval flint buildings that still dominate the village. Quay House (NHER 25851) is an early 18th century house, which may be built around an earlier core, and the 18th century façade of the Old Rectory (NHER 20586) conceals a much older timber framed hall house. Many of the buildings in the High Street date to the 18th and 19th centuries when Blakeney was still enjoying a buoyant economic life. A number of post medieval earthwork banks (NHER 27081, 27201, 27082) on the marshes were constructed, often by local landowners such as the Calthorpe family, to attempt to reclaim some of the land that was becoming salt marsh, to turn it into more valuable land. The gradual silting up of the estuary, encouraged by reclamation schemes, led to the decline of the Glaven ports, which was hastened by the arrival of large steam ships and the railway in the mid 19th century, which allowed cheaper, and faster transportation of goods. 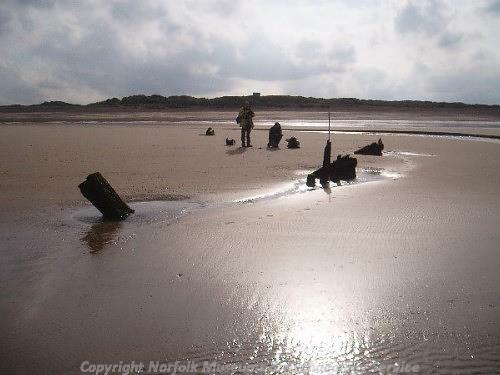 Today the most poignant reminders of Blakeney’s vibrant seafaring past are the wrecks (NHER 18863, 18864, 22877, 22878) of ships that are scattered along the coastline. Sarah Spooner (NLA), 4 October 2005.